Somewhere between the point I learned to ride a bike and the year I saved enough money to buy a pair of rollerblades, I gained permission to drive the riding lawnmower down the driveway and around the road's bend to my uncle's house--a .2-mile blip that stretched forever when using the mower's "turtle" speed setting. My uncle and dad co-owned a farm equipment store in Smithfield--inherited from their father and their father's father, who started the thing as a mule company in the Thirties. This was something of the family tradition, the preferred mode of transportation. I have a framed photograph of my dad atop a Model B tractor, about the age I was on my maiden mower voyage. And though the picture is black and white, I know the tractor was orange: the signature hue for both the Allis-Chalmers and Kubota rigs we sold. In the rural world there are John Deere families, and New Holland families, and Farmall families, and Massey Ferguson families. But we were solidly an Allis-Chalmers and Kubota family because we were an orange family, one sustained on the likes of pimento cheese, cheese puffs, and Cheez-Its. That's not to say we didn't eat our vegetables. My dad kept a garden in the backyard and my mother swears (and photographs concur) that I ate so many carrots as a kid the tip of my nose turned a bright shade of tangerine. But when we did eat our greens, we often (and I always) covered them with a sheath of American cheese. The real crux of orange living, however, is the Nab--a simple combination of two cheese crackers and a smear of peanut butter that takes its name from Nabisco, which manufactured an early line of the snack, but was made by multiple brands. *Keep reading in The Carolina Table: North Carolina Writers on Food (Eno Press, 2016). Under the brim of Pedro’s 200-foot-tall Sombrero Observation Tower, across from the Hats Around the World store, between statues of neon animals and a few steps from the Reptile Lagoon—this was supposed to be the spot. But a blank stare on the other side of the register told us it was not. “The what?” a cashier asked. We were standing inside a T-shirt shop at South of the Border, the sprawling tourist park known fondly as “SOB,” located off Interstate 95 and Highway 301, just inside the South Carolina line. Having grown up along the I-95 corridor in North Carolina, this was a forbidden place—one well associated with a past of gambling, booze and seedy motels. Unbeknownst to many (even those selling the stuff), it’s also home to one of the country’s most beloved producers of ginger ale. My friend (and photographer) Kate Medley pointed to a small display of Blenheim Ginger Ale bottles stacked by the register. Soon two more employees were called upon to help us locate the bottling plant rumored to be on site. “I think it’s behind the truck stop, way back in the woods somewhere,” said an SOB worker dressed in a “#1 MOM” T-shirt. Although she had never been to the facility, she admitted to having just polished off one of the spicy golden ales. "Camille's grandmother loved Duke's mayonnaise and costume jewelry," Amy Cameron Evans, 2008. *Read on in Southern Living. *Read on in the Washington Post. How far will you drive for fried bologna? Here's my trek for the Indy Week , including speedway queens, tallboy Modelos, and a super flattering photo. How to combine degrees in studio art and food studies: a guest blogging stint with the Southern Foodways Alliance. They've been kind enough to let me write about a giant snowball stand, pimento cheese art, oyster knife patents, and family sandwich doodles. A few entries are linked below. What Do Oreos, Nutter Butters, and Milk Bones Have in Common? Miss Sun Beauty (one of several fashionable yams, including Yammy Boo Boo, Tator Swift and Dan Yam-sen). Perched above racks of hand-sewn sweaters and silkscreened T-shirts at a clothing store in Wilmington, I recently came across the story of my life. 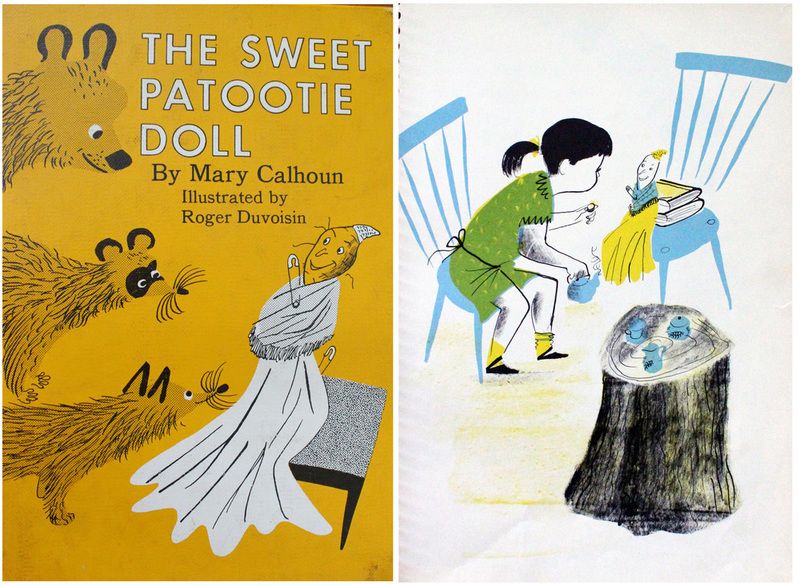 It was the Sweet Patootie Doll , written by Mary Calhoun, illustrated by Roger Duvoisin and deconstructed in the form of a journal. Published in 1957 by William Morrow & Co., the children's book is about a small girl named Lucy who could be almost any child from my home in Johnston County. Lucy saw much more in a sweet potato than a casserole or pie, which are pervasive this time of year. From the shape of a dusty old vegetable, she imagined a doll, with a bump for a head, "two specks, just right for eyes, and a brown, curvy scratch, just right for a mouth" My neighbors and I used to have the same visions. In Johnston County, a place that harvested 181.6 million pounds of sweet potatoes in 2011, we are groomed from an early age to appreciate the nicks and nobs on potatoes, seeking faces and shapes in them the way most children do with clouds. The twisted tail of a yam is coveted for making a cow or hog. Prickly whiskers are cherished just the same. *Read on in the Indy Week . Clouds should have been the obvious choice. But for the source of cotton candy, my 4-year-old self looked into the dark corner of a gym beyond the bleachers and royal blue tumbling mats, where I spotted a wad of light gray fluff. I crammed a fistful of the billowy stuff in my mouth and learned that it was not sweet, would not melt and, as explained by my gym teacher, was actually a dirty thing that went by the deceivingly cute name dust bunny. 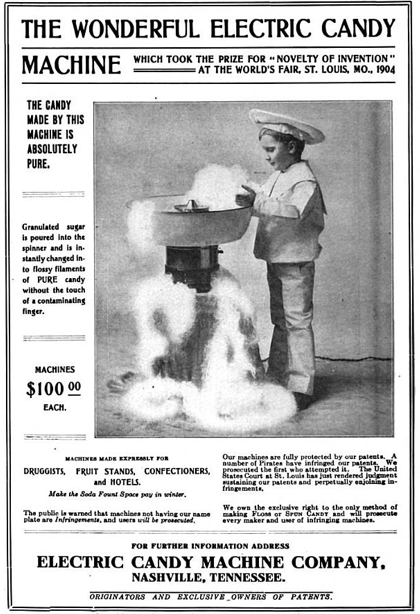 Decades later, I still was unsure of the origins of cotton candy (though acutely aware that it doesn't occur naturally). So in preparation for the cotton candy season--when one vendor churns through 1,400 pounds of pink sugar during the 11-day North Carolina State Fair--I settled in at the library to find its roots. *Read on in the Indy Week. I'm the (proud) idiot in the center with my hands raised. We fell in line before 8 a.m. with hopes to meet the tan man with the tall white hair. Years of watching television told us to go in bold colors for this taping of The Price Is Right and a hokey but genuine saying for Bob Barker. "Childhood Dreams Do Come True" read our neon green T-shirts with iron-on, velvet pink letters. Barker had recently announced his impending retirement, and the five-hour-long row of folks that swooped around the show's southern California locale, The Grove, teemed with talk about what people would say to Barker if given the chance. There were thank yous and I love yous and proclamations about pets. I felt confident I could wing it; after all, earlier in the week, I'd introduced myself to Delbert, my estranged grandfather. Met third-generation farmer Stanley Hughes (and ate my favorite kind of cake) at the 100th anniversary gathering on Pine Knot Farms. *Read in the Indy Week . It’s nothing new for me to eat cheese at every stop in the Triangle, but this time I did it for Culture. The short, stocky, thick-skinned jalapeño needs no label: its shape is identifiable to even the most novice pepper eater. Equally familiar is the triangular black-green poblano, and, of course, the large, lantern-like bell. What causes confusion among Kevin Meehan’s customers at the Carrboro Farmers’ Market are small, heart-shaped peppers that blush in late summer. “I put them on the table because they are a conversation piece,” Meehan says. “You’d be amazed at how many people pick [them] up because [they’re] unusual looking.” But while most folks think they’ve come across something new, they’ve actually found something quite familiar: the pimiento. It’s the stuffing in pitted green olives. It’s the pretty dot in cheese. And it’s one of a two-part item ordered often in the South and increasingly beyond. Pimento cheese would be nothing without it. Try imagining any level of fanfare for a mix of plain old mayonnaise and grated cheddar. Pimientos provide a welcome sweet and sour flavor, one that’s more complex that their ubiquitous first cousin: the red bell pepper. They also make the spread look good. 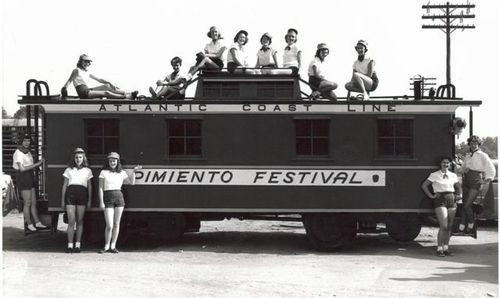 As an early Kraft advertisement once described, they gave the spread the appearance of being “studded, like rubies.” But most importantly when it comes to pimento cheese, it’s the pepper that rooted the spread in this region. *Read on in Edible Piedmont. But the gray store with wood siding on N.C. Highway 86 is something of a grocery, and a pretty good one. Though it operates two fuel pumps and sells what has become many gas stations’ standard fare—bagged chips, cheap beer and neon-colored Slush Puppies—it also stocks its coolers with lamb and bison from nearby farms. There’s local milk, mini pies made by neighbor Mary Justesen, and an extensive selection of regional beers. The Farm & Garden is one of many filling stations to offer food that’s a step above tired, twirling hot dogs or packaged Pop-Tarts. It is also one of the easiest spots to find: A row of squat white signs spells the store’s bounty along both sides of the two-lane road leading there. More often, billboards reveal fuel brands and prices over specialty fare; it’s BP, not biscuits. Photo by Jeremy M. Lange. Photo illustration by JP Trostle. Twelve billion times a year, a disc of vanilla cream is stamped between two chocolate wafers to produce the Oreo, the world's most popular manufactured cookie. An American staple since 1912, the Oreo has a flavor that contrasts sweet cream and crisp chocolate cookies. Its texture is marked by a distinct decorative pattern: a small, circular border hatched with short, shallow lines and an interior ringed with four-leaf clovers. But the cookie, 491 billion of which have sold worldwide, still leaves some details in question. "Who Made that Oreo Emboss?" read a recent headline on a New York Times blog. "Bill, Chapel Hill, NC," answered: "My father is William A. Turnier. He worked for the entire 49 years of his working life at Nabisco. In 19 he was assigned the task of producing a new design for the Oreo." It turns out Bill Turnier of Chapel Hill really is the son of the man who, by nearly all accounts, designed the modern Oreo. To many, Bill Turnier's comment wasn't breaking news. Cookie and design enthusiasts have long credited William A. Turnier as the cookie's artist—and no one else has publicly emerged to claim the title—but they've done so without knowing many details about his life. Bill Turnier has those details—stories and memories of his dad, a former mail boy-turned-design guru who also put his imprint on the Nutter Butter and the Milk-Bone. And he has the proof: High above a closet door in Turnier's tidy brick home in east Chapel Hill hangs a framed copy of the blueprint for the Oreo's most enduring design, unchanged for nearly 60 years. In the corner, the printed name: "W.A. Turnier." Perhaps you know what day your favorite local restaurant features lima beans on the menu as the vegetable special, or when the chocolate layer cake is destined to make an appearance. If not, here’s your chance to find out, or to broaden your horizon beyond the lunch shop on your block. Today marks the start of Meet-and-Three, a biweekly series on Big Bite that will present, over the course of the next few months, people and stories behind some of the Triangle’s meat-and-three style restaurants. New cafes created a place where office workers could buy cheap, fast and filling meals. (This was not necessarily the case for factory and millworkers, who were forced to eat on the job as they found time.) But while the table around which many gathered to eat lunch changed from a home setting, the menu did not—at least not overnight. “A plate lunch of one meat and three vegetable or starch sides, served with a buttered yeast roll, harkened back to the traditional mid-day dinner of rural Southerners, but was served uptown,” Ferris said. After World War II, restaurants increasingly popped up outside of town centers with the rise of the highway system and a car culture financed in part by money that veterans received from the GI Bill. With this came an onslaught of barbecue stands and drive-up cafes like the Toot-N-Tell restaurant near Highway 70 in Garner.